There are tons of local holiday festivities in the area that kick off in November. 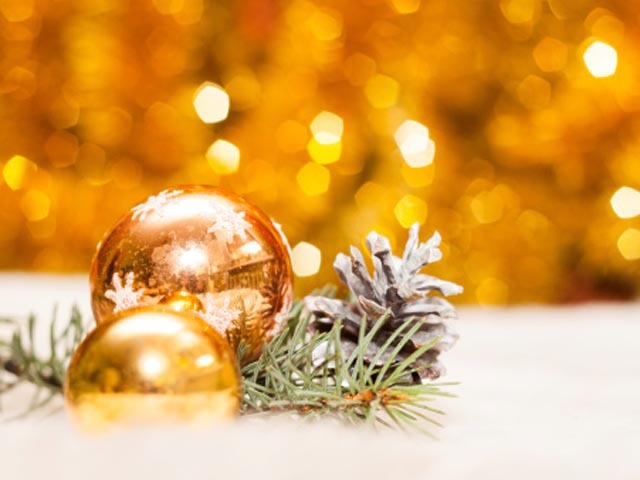 ​Here are some events you don't want to miss! 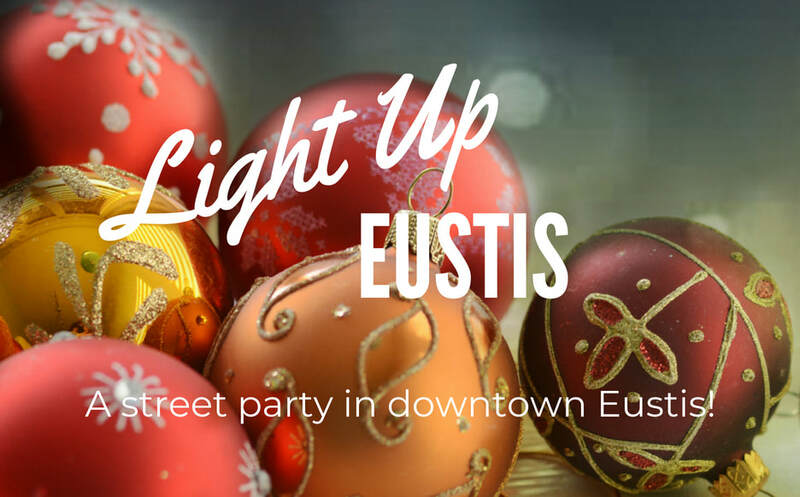 This free party to celebrate the holiday lights of Eustis brings Santa and Mrs. Claus to downtown along with real reindeer, live music, food vendors and more. 5 to 9 p.m. This year there will also be snow and a 75' snow slide for the kids. 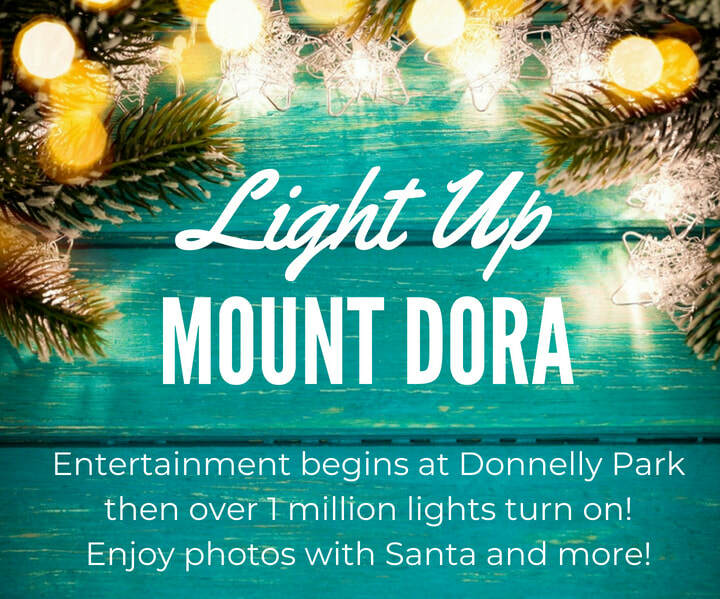 Festivities begin at 5:00 pm with a pre-show and live entertainment at 5:30 at Donnelly Park downtown. Stores and restaurants open. Over a million lights switch on at 6:30. Parking shuttles available at Mount Dora High School and Mount Dora Christian Academy. 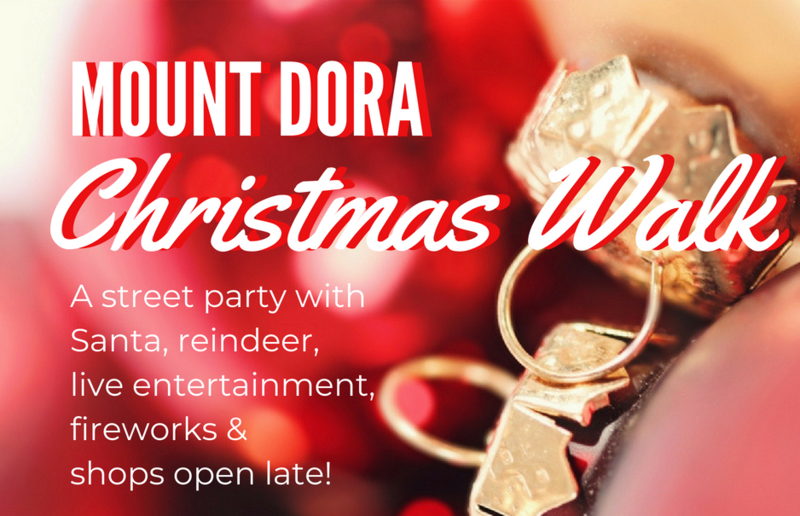 This magical downtown Mount Dora event brings the streets of downtown alive with live holiday entertainment, photos with Santa and a 40-foot lighted musical Christmas tree at Sunset Park. 6-9pm. Downtown stores and restaurants are open late. Check out the local shopping guide here. Imagine Charles Dickens comes to Renningers Antique Center in Mount Dora. In addition to antique, vintage and steampunk finds, there will also be carolers, live music and entertainment by Phantasmagoria, DJ Vlad and others on Saturday. Opens at 9 am each day. Free. Bring your new unwrapped toy and kick off the holiday season with a beautiful light display and helping Florida children in need. Happy Holidays! 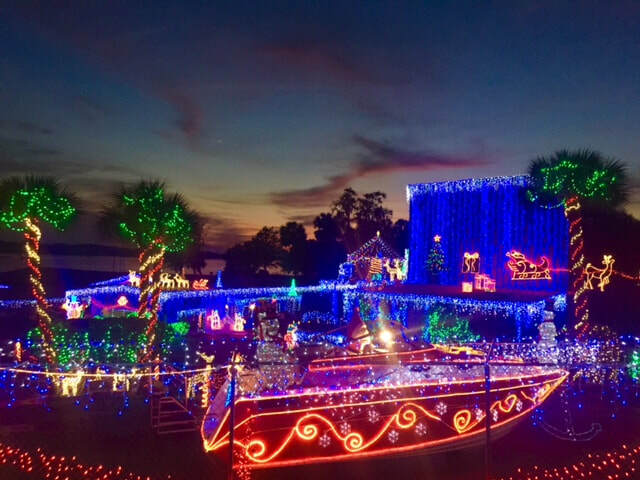 This special Toys for Tots collection event is hosted by Mount Dora Marina, the largest private display of Christmas lights and decorations in Central Florida. On this night the marina opens its gates from 6 to 9 p.m. for families to walk the grounds to view the festive display up close. Admission is one new unwrapped toy. 148 Charles Street, downtown Mount Dora lakefront. 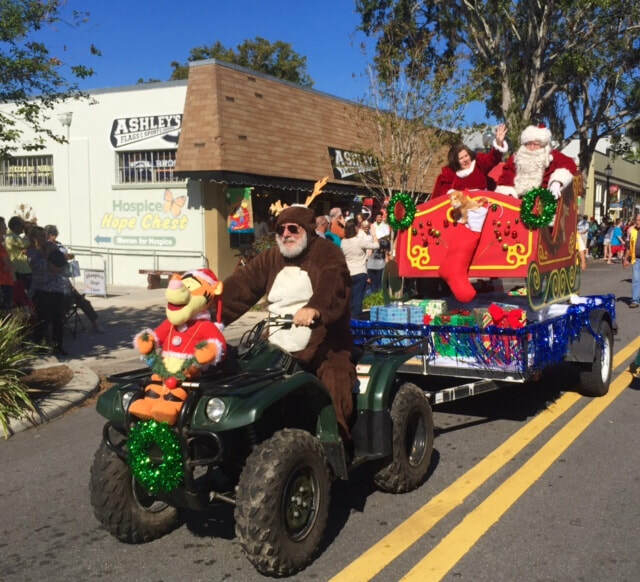 Typically, the first Saturday in December, this free, annual happening takes place in downtown Tavares with a parade that begins at 5 p.m downtown, followed by a celebration in Wooton Park. Enjoy live music, Santa, a giant snow globe, a Christmas movie in the park, the Polar Express train and more. Small boats lit up for the holidays depart from Mount Dora's lighthouse at 7 p.m. and continue up shoreline toward Tavares. Pull up a piece of the shoreline to watch! This traditional German Christmas market is held annually at the Yalaha Bakery and features local artists, pottery, German crafts, Christmas vendors and the ability to decorate your own gingerbread house. The festivities run 9:30 am to 4p.m. on both days. ​Tour Mount Dora homes that are beautifully decorated for the holidays. This self-guided tour begins at the Country Club of Mount Dora. After check-in, tour guests may enjoy complimentary coffee, tea, punch, and cookies while listening to Christmas themed music provided by local musical students and local area musicians. Tickets are $20 online at wcfamountdora.com. Join the 'tree-mendous' time singing holiday favorites with the Triangle Elementary children's choir from 4:30 to 6 p.m. Cookies and punch are served in the Butterfly Garden. The Mount Dora Dulcimer Society and a Ukulele Band will perform. Kids can get creative the ornament making workshop and make Christmas cards with the PAWS Therapy dogs. Watch Santa & Mrs. Claus light the Christmas tree. Meet Margaret and H.A. Rey's storybook character, Curious George. All ages are invited to decorate a giant gingerbread man cookie in the Children's Program Room at W.T. Bland Library in Mount Dora from 10:30 to 4 p.m. on both days. There is a recommended $4.00 donation to cover cost of materials. All ages welcome. Pre-purchased ticket required and available beginning Friday, November 16 at the library. Bring your creativity! Free concert at 2 p.m. featuring a band that brings together bluegrass, Americana and folk styling with hot picking on banjo, bass, fiddle, guitar and mandolin. Seats available on a first come, first served basis at W.T. Bland Public Library. No registration is required for this free program. Sponsored by the Mount Dora Library Association. Mount Dora Police Department hosts its annual holiday party for the neighborhood from 9 a.m. to noon at the Martin Luther King Center located at 803 Florida Avenue. The fun atmosphere includes an obstacle course game, bounce house, music, and food, and of course, Santa Claus! Snow typically falls on the second Saturday in December and children can enjoy free sledding and ice skating in downtown Mount Dora's Donnelly Park. The event is free and the fun starts at 5 p.m. and goes until 9 p.m.
Lake Concert Band will perform a free concert of holiday classics at Mount Dora Community Building. Monetary donations for Lake Care Food Pantry will be accepted to help less fortunate families in Lake County. 7-9 p.m. Downtown Mount Dora becomes a free street party at Sunset Park begins at 9 p.m. There will be food, music, as well as fireworks at midnight. ​Download the free Mount Dora Buzz mobile app here and follow the Mount Dora Buzz Facebook page.